Blue Bolt #8 initiates a working methodology that Simon and Kirby would use often in years to come. Kirby would ink his own splash panel while leaving the rest of the story to be inked by other artists (besides Joe Simon). Kirby’s inking tops off an already spectacular splash. While in later years Jack’s primary interest was the story art, during his collaboration with Joe much emphasis was placed on covers and splashes. Great stories may have built the Simon and Kirby reputation but covers and splashes are what drew attention and persuaded comic book readers to spend their money. Of course having all the story inked by either Kirby or Simon would be preferable but if that was not possible the next best thing was for Jack to ink the splash. It has been said that Kirby pencils could withstand even poor inkers. Well the story art to Blue Bolt #8 certainly puts that claim to the test. As I mentioned previously, I will not try to identified the inkers other than either Kirby or Simon but one or more of the assistants from the Timely bullpen were likely candidates for this work. Al Avison, Al Gabriel and Syd Shores were very young and just learning their trade. 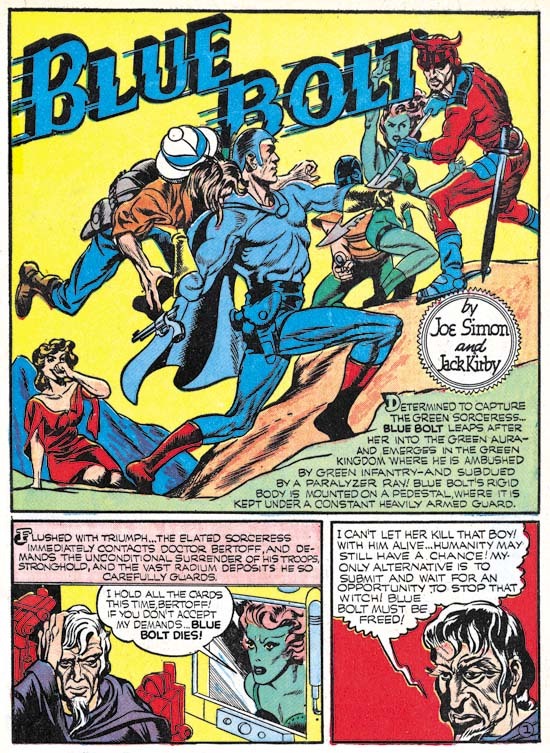 Blue Bolt was a serialized comic feature. Not quite like in the movie serials as Blue Bolt did not have “cliff hangers” endings. Instead each story would be complete but with an ending that left open the question of where the tale would go from there. The Black Owl feature from Prize Comics #7 leads to PC #8 in the same manner. However the ending in PC #8 does not suggest further development of the story in the next issue. 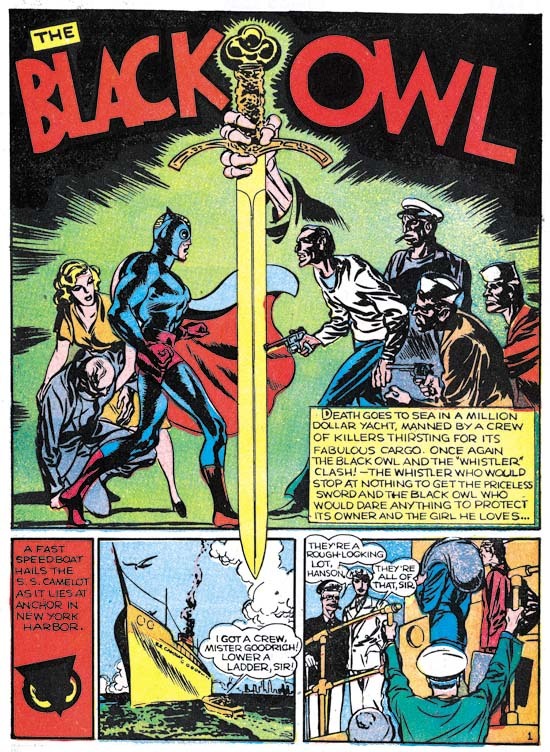 This issue was included in a previous post (Simon and Kirby’s Black Owl). Kirby provided the lettering for PC #8 and since I have prepared samples for a previous post (Jack Kirby as a Letterer) I will repeat them here. 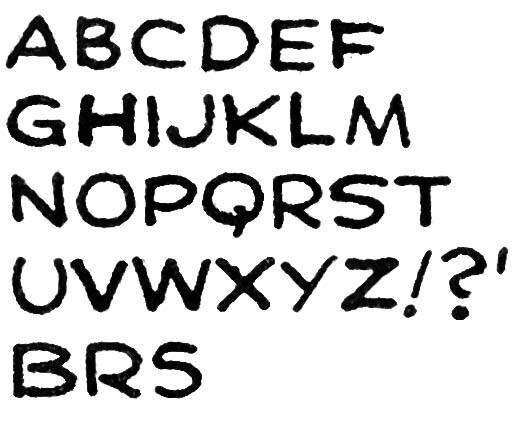 But truth be told Kirby’s lettering really has not changed from the previous sample that I provided (Red Raven #1, August 1940, shown in Chapter 5). 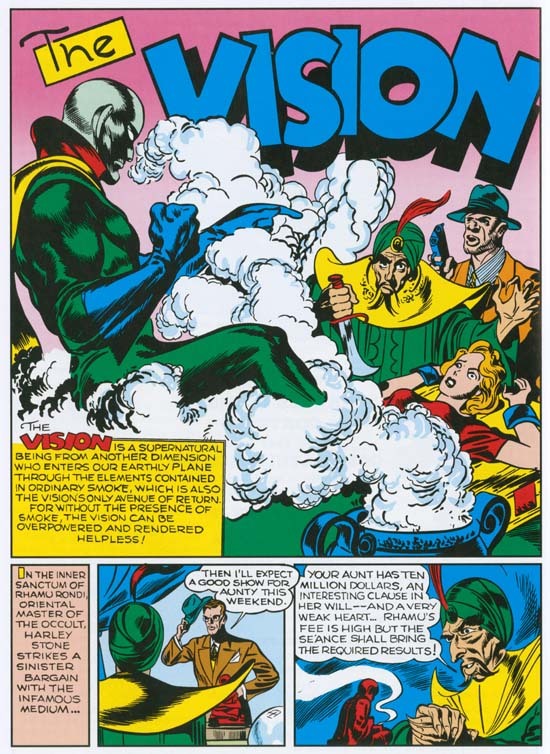 As with Marvel Mystery #13 and #14, Kirby seemingly does it all, or at least all the visuals, for the Vision story in MM #15 (January 1941). Of course Simon might have had something to do with this feature, he was after all the editor. Ferguson provided the lettering in Marvel Mystery #15 for the Human Torch and Terry Vance features. I have chosen this chapter to include some moonlighting work that Simon and Kirby did for Fawcett. Unfortunately the dating of this work for is uncertain as the comic books lack dates on the covers or in the indices. One of the works was Captain Marvel Adventures #1. 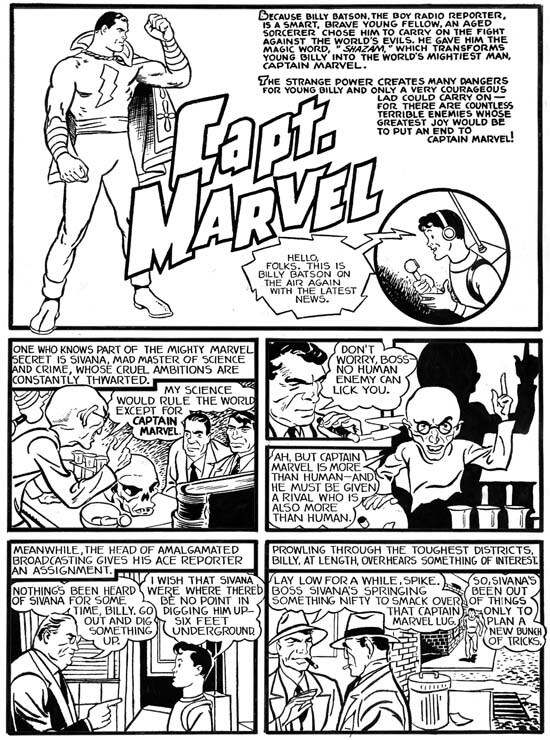 This was the first comic book dedicated to Fawcett’s new hit Captain Marvel. It must have seemed a rather troublesome assignment. 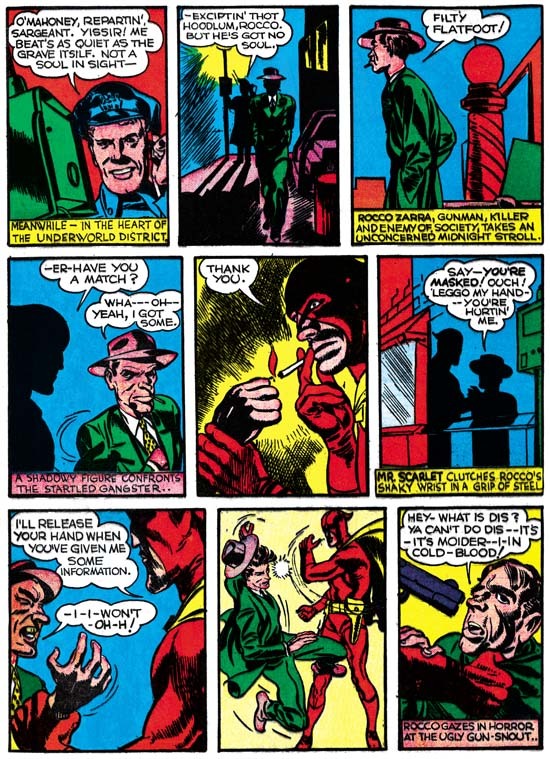 Not only did the art have to look like the work that C. C. Beck had previously done on the character, but also Simon and Kirby were not allowed to alter the scripts (Joe Simon’s Fawcett Testimony). The pencils had to be returned to Fawcett for lettering and then picked up again for inking. Yet despite all this the final art is rather nice. Kirby was never very good at imitating other artists and despite the simple lines of the artwork Kirby style keeps showing up. Beck might not have been pleased but in my opinion Simon and Kirby’s version was much more interesting. I have no idea who the inker was but it certainly was not Kirby, Simon or any of the assistants from the Timely bullpen. Whoever it was they did a marvelous job. It is uncertain whether this work was done before or after Captain Marvel. In the Fawcett testimony Simon said it came later however that testimony was given some eight years later and therefore might not be accurate. Mister Scarlet appears to largely be the work of Jack Kirby but Joe Simon’s presence is revealed in some of lettering. His distinctive ‘W’, ‘M’ and other letters make their appearance in some of the text as for instance in the captions in panels 1, 4 and 6 from page 2 shown above. All the Simon letter that I have spotted so far comes from captions and not the word balloons. This suggests that Joe was trying to make an existing story clearer. This feature is also a good reminder about the problems of identifying Joe’s contributions in Simon and Kirby productions. Had this story been lettered by someone other than Kirby and Simon, Joe’s additions would have gone unnoticed.